CFP: Critical Information 2012 @ SVA / watch me talk briefly about Handle with Care. I know a few grad students (you poor souls) read this blog, so I thought I'd share a CFP for a grad student conference I participated in last year -- Critical Information is pretty small, but the intimacy helps you engage the people with the people actually sitting there. Some people were asking about a video? Here's a highlights reel they put together of my group's session. (Note to self: next time, shave.) Also, see if you can pinpoint the exact moment in the Q&A when I enraged an entire room full of gender studies scholars... or, uh, hopefully they edited it out? 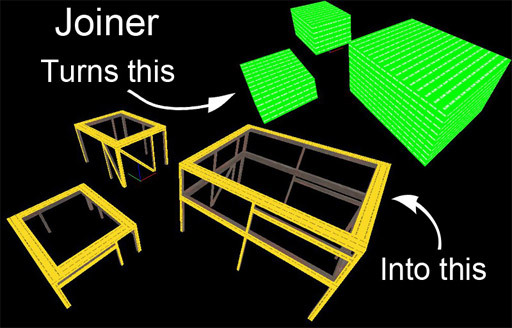 Joiner is a command-line pre-compile brush generator by prolific TF2 mapper Timothy "YM" Johnson; you make several brushes to represent the volumes of your rooms, run your VMF through it, then out comes another VMF with all the struts and support beams built and textured for you. I find Joiner fascinating because it's also (an unintentional?) commentary on TF2 design styles: rooms are still composed mostly of simple rectangular planes that join at 90 degree angles -- that's the actual functional level geometry, but a typical player would recognize that as undetailed and thus as an unfinished / crappy map. What Johnson has made is not a "make level" button, but rather a "make detail" or "stop players from whining" button. The purpose of these struts is to cover the surface in a sort of greeble, so the player won't be distracted in comparing its perceived quality against other maps with "better" detail. Surface detail is a paradox. It is "necessary" to exist in front of the player, but it exists to be more or less ignored. These are some unreleased levels / environment WIPs I've seen posted around the internet, along with some brief commentary. Island of the Dead, by Mac "macattackk" Hart. 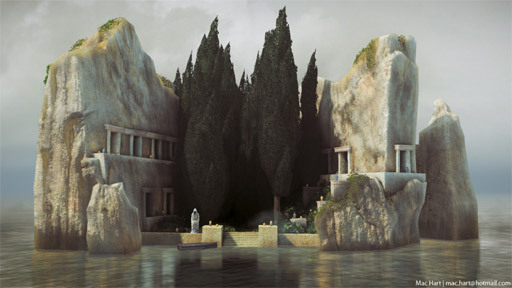 Hart bases this CryEngine3 environment off the Arnold Bocklin's notorious Isle of the Dead paintings. What I really admire here is the masterful control over materials; the normal map on the rocks is really important to ground the unorthodox shape of the rock. It's a really surreal treatment of realism that, I think, is really subtle and difficult to pull off -- a desaturated, muted palette that somehow isn't boring. What I like most about this piece, though, is that Hart is actually fleshing it out into a level. He could've stopped with this one view and one camera angle to produce a diorama / portfolio piece, but now it's actually turning into a legitimate space as he extrapolates the painting's original style. 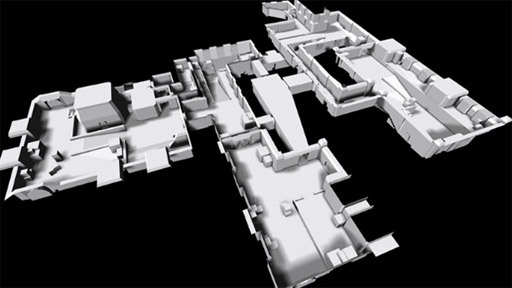 Why game architecture matters, and the reality / unreality of de_dust. 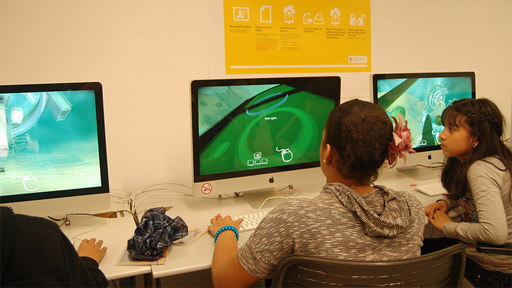 “Computer games differ from other mediums such as books, movies or TV, in that spatial cognition is a crucial aspect in computer games. To win a game the player needs to know the 3D game space very very well. Spatial recognition and remembrance is an important part of our human capability and has formed over millions of years by evolution. A place, house or space inscribes itself in our spatial memory. We can talk about the qualities of the same movies we watched or books we have read. How the worst part of the game industry uses PAX East to teabag your entire face with its cancerous scrotum. First, understand that PAX East is actually made of two conventions. Literally, a gigantic wall divides the analog (card and board games) from digital (the video game industry). 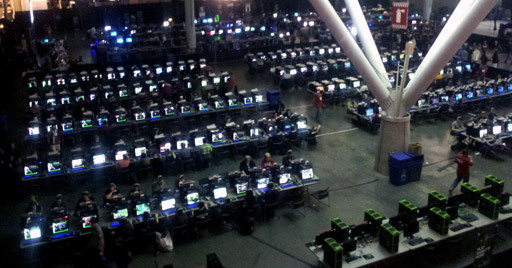 In game design, it's popular to say that analog and digital games are the same at their cores, because they both depict systems -- and PAX East is the place where all that rhetoric utterly falls apart. One side of the convention floor is a quiet and personal pastime, the other is a deafening business. If you're a games academic or optimistic indie, this dissonance will test your faith, because here the game industry teabags your entire face with its cancerous scrotum. Well, when you go out for a walk, do you have a goal? No, you just walk because you like walking. "Yeah," she said, "but if all you do is walk around, it gets boring after a while. I'll stop playing." Well, that's fine, then stop playing. "Plus," her friend says, "I'd just play it once. And then it would gather dust on my hard drive." That's fine. Play it once and delete the game then. "But like, if I wanted to walk around, I'd just go outside." That's fine. Then go outside! They're so young, and already they're perpetuating the same messaging from massive industry interests: that the "realism of games" competes with the realism of reality, addictive games are better games, clear goal structures are best -- and retention, retention, retention. That's just one way of thinking about games, and they've already locked themselves in that mindset. They've been indoctrinated.